In electronics, a variety of circuit methods and designs are available for any given goal. Most books present a single solution to a design problem, but Kevin O'Connor's books offer many possibilities. It's nice for a builder or hobbyist to know the reasons for choosing one method over another. Like any electronics designer, Kevin O'Connor prefers certain circuits and methods. However, rather than simply giving instructions, Kevin explains why one method may be preferred over another. The selection of a method is up to you, and you can proceed on the basis of informed choice. Electronics is a very wide discipline; audio amplifier technology is just a small part of it. Approaches to audio design in the musical instrument (M.I.) field are very restricted - a limitation that the M.I. industry imposes upon itself, sometimes through simple lack of imagination. Fortunately, Kevin O'Connor's books look past what is done to what can be done, offering the reader a glimpse beyond the state of the art. Kevin O'Connor's practical approach is based on real-world experience in repair, design and construction of all types of audio equipment. Tabled data in his books are the result of measurements of actual circuits. Design options are those used by Kevin over the past decades, and are "known-good" circuits. Electronics has its own language of schematics, symbols and mathematics. Hobbyists can find these intimidating. Kevin explains the essence of circuit operation in easy-to-understand language that conveys respect for the reader and the subject. We all learn together. Depending on where you are on your own path of enlightenment, Power Press has books that start right at schematic symbols; others that use text only; or most, that assume some schematic reading abilities. Audio design is often clouded in "mystical secrecy" - particularly in musical instrument amplifier design circles. Kevin O'Connor's books "clear the smoke away" and reveal the simplicity of most designs and modifications. 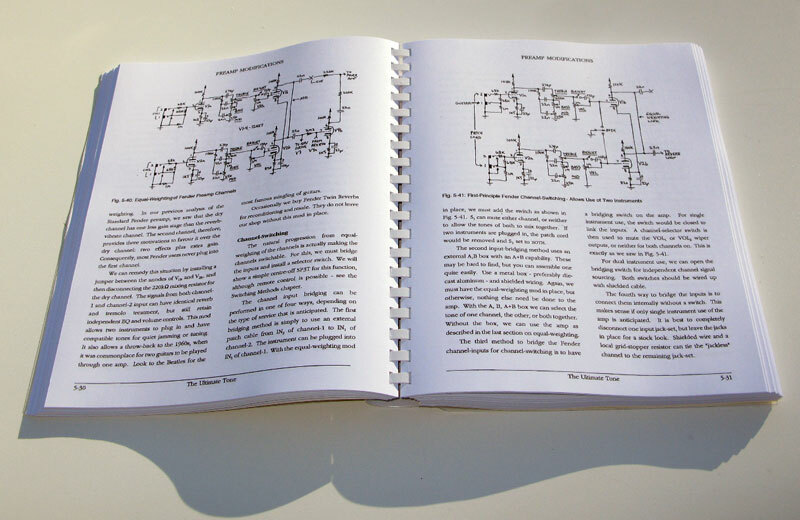 The Ultimate Tone (TUT) is the bible for boutique amp builders. Many have gained ideas and their courage from TUT. A number of "reference" websites appeared with information from TUT repeated nearly verbatim, on the heels of TUT's release. The Ultimate Tone Vol. 2 (TUT2) is the unsung hero in Glass Audio magazine's 'Glass Shards' column. Principles of Power (POP) is a popular reference cited in many audio power amplifier projects in Glass Audio (this magazine is now titled Audio XPress). Kevin continues to write and publish information for hobbyists and amp builders alike. The open-ended TUT series continues. Specialty publications such as Secrets and Secret Holders (SSH) will continue. Kevin's DIY Speaker Design for Musical Instrument Applications (SPKR) booklet allows individuals to build their own cabinets for guitar, bass or keyboard. Kevin O'Connor's books are intended to be used as well as read. The reader is encouraged to build circuits from the books and "do-while-reading". Each publication has protective clear covers and is cerlox-bound to lie flat on your workbench. Our pages have no large margins to waste space. There are no photos of amps, as these do not teach you how they work. There are no large advertisements for the author's own products. There are no repeated legal disclaimers occupying valuable schematic space. There is just information - lots and lots of information! - in both text and schematic form. Read a recent review of Kevin's books by Mark Douglas Roberts of tubenexus.com. Which Volume Should You Start With? Check our page: Selecting a TUT Book.